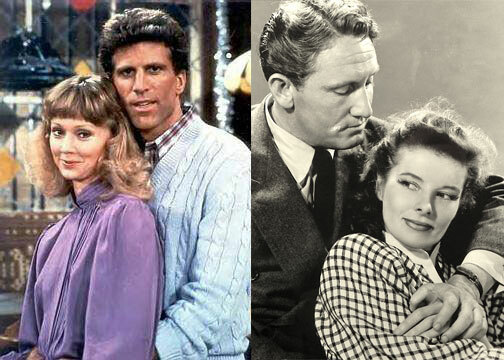 Sam and Diane were modeled after the classic on-screen couple. Do we see a resemblance? Spencer Tracy and Katherine Hepburn met in 1941 and shortly thereafter filmed their first film together, Woman of the Year, in which Tracy plays a sports reporter and Hepburn a “high brow political writer”. Already we are seeing echoes of their influence. And with your eyes closed, the bartender’s “That’s a beautiful thought Sammy” could easily be mistaken for Coach’s in any given episode. Off screen, their relationship would last until his death in 1967. Although Tracy never officially divorced from his wife (he was a Catholic, burdened with guilt), the two lived together for most of that time, and they set the gold standard for the breathless Hollywood love affair. On screen they created the template for the back-and-forth sexually charged banter that define Sam and Diane. This scene from Adam‘s Rib is a wonderful example of a perfectly wonderful moment interrupted wiith the irresistible back-and-forth that these couples represent. Shelley Long is an expert at this Hepburn-style feminist foot-stomping that begins at about 2:00. And if you are looking to do some more homework before we dive into the nearly endless saga of Sam and Diane, there’s always Pat and Mike, in which Hepburn plays an athlete falling for her trainer. Will they? Won’t they?